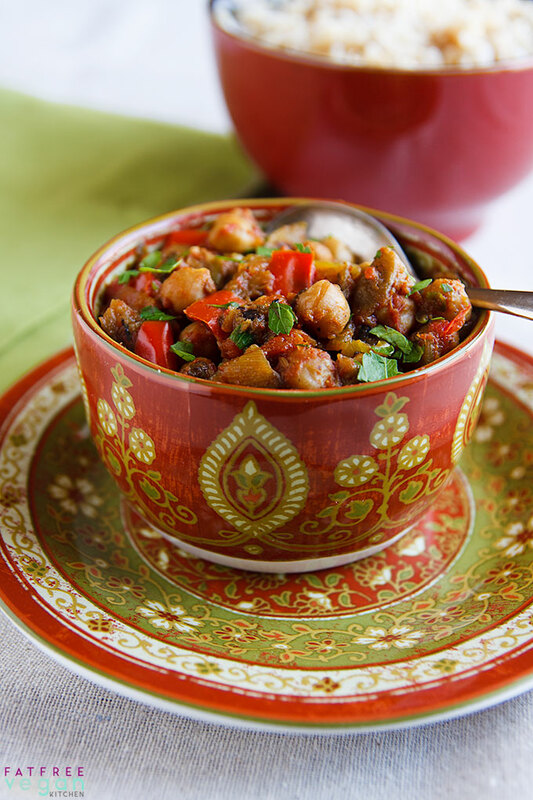 Eggplant meets chickpeas in this legume-filled version of Baingan Bharta. Spicy, aromatic, and downright delicious! Sometimes when a recipe is truly great, I find I have little to say other than “Make this.” So, if you like Indian food in general and Baingan Bharta in particular, make this. It’s as good as or better than what you’ll find in a restaurant but without a lot of oil or, possibly, butter and it’s certified delicious by my resident eggplant-hater. Before you run off to the kitchen, let me admit that yes, I made baingan bharta and basically added chickpeas to it. Laziness is the reason, my usual desire to get vegetables and protein all into one dish so that I don’t have to make side dishes. In this case, I could have used some sides because this dish was so mouth-watering, so appetite-inducing, and yet so light that we were all three still hungry after we’d polished off the 4 average-sized servings. So plan to either double the recipe or make some side dishes. I suggest Red Cabbage and Peas with Cumin and Mustardseed, Baked Spinach Kofta, Palak Tofu, Bhindi Masala, or any of my Indian recipes. Finally (boy, I just can’t shut up), I really need to point out that you can get all of the essential ingredients at almost any supermarket, but if you have an Indian grocery store nearby, you’ll be able to find asafetida and ginger paste there. Neither is a necessity, but I find the ginger paste to be a big time-saver, as well as a recipe-saver when all my fresh ginger root seems to have become dried up, gnarled, and downright scary in my fridge. You’ll also find fresher garam masala in an Indian store than you will in a supermarket, but not as fresh as if you make it yourself; see the end of the recipe for ingredients before you head out on your shopping trip. 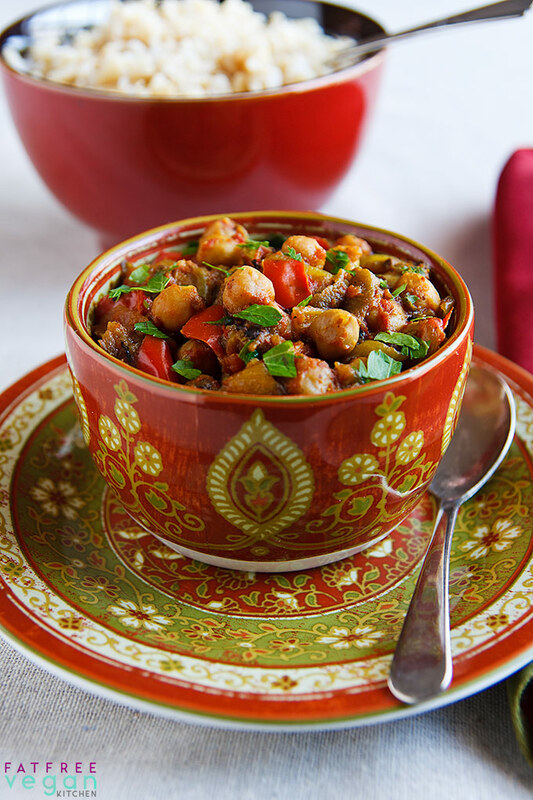 Eggplant meets chickpeas in this vegan, chickpea version of Baingan Bharta. Spicy, aromatic, and downright delicious! And it’s a zero points food on Weight Watchers! Heat a non-stick skillet. Add the onion and cook until it begins to turn golden. Add the bell pepper and cook for a few more minutes. Clear a spot in the center of the skillet and sprinkle the cumin seeds directly on the hot surface. Stir and toast them for about a minute, until they become fragrant. Stir them into the onions and peppers and add the coriander, turmeric, asafetida (or garlic), tomatoes, ginger paste, and red pepper. I used freshly-made garam masala, which is more flavorful than most store-bought blends; depending on your spice blend, you may need to add more to get the right flavor. Garam masala recipes vary, but my current favorite is to combine 1 tablespoon black cardamom seeds, 1 cinnamon stick (about 2 1/2 inches long), 1 teaspoon cumin seeds, 1 teaspoon whole cloves, 1 teaspoon black peppercorns. Grind in coffee or spice grinder until powdered. Heat a small, dry pan. Add spices and toast just until fragrant, about 1 minute. Remove from heat, transfer to a bowl, and allow to cool. Once cool, store in a sealed jar for future use. 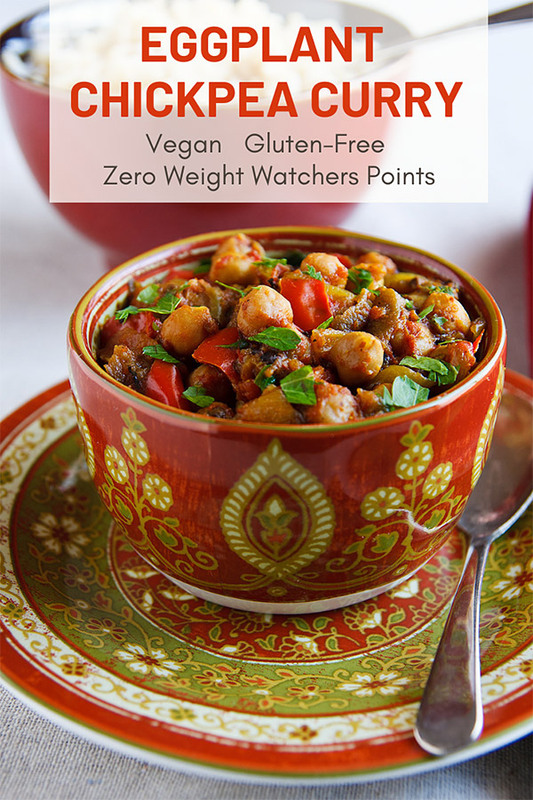 This recipe alone (no rice) is zero points on Weight Watchers Freestyle program. This was amazing. The only issue I had was peeling the eggplant after I roasted it. Will try doing it before, however the dish still came out amazingly. Glad to have found this website and can’t wait to make your other dishes. is it possible to use ground cumin instead of the seeds, since that’s what i have? would it make a huge difference in the outcome of the recipe? thank you. The seeds give it a different layer of flavor, but if you don’t have them, you can just add about 3/4 tsp. of ground cumin along with the other ground spices (no need to toast the ground cumin). Why is it either — 1/8 teaspoon asafetida (or 1 clove garlic, pressed) when they are completely different kinds of foods. I am so glad you posted about this on Facebook today. I just bought 2 eggplants yesterday and was wondering what to make with them! Love your recipes, my wife subscribes. Many call for spices in whole seed form, ie, cumin, cardamom, etc. I’ve always used ground spices for convenience and thought it actual gives more flavor per dollar. What am I missing?? Hi Robert. For most things, ground spices are fine and probably cost-effective. But there are advantages to whole spices. For one thing, as soon as you grind a spice, it begins to lose flavor. The delicate oils that carry the flavor are volatile when exposed to air, and they immediately begin to lose potency. If you ever have a chance, compare the tastes of whole and ground cumin, and you will see what a huge difference there is. Thanks for sharing this recipe! I made it for a dinner party and it was delicious. Super useful for non-vegans to add to their suitable-for-all-dinner-guests repertoire. I try to stick to exact measurements when I’m cooking but when it comes to adding the spices, I end up just throwing in what I feel would work (or what looks like it could possible be 1/4 tsp, but ends up being more like a whole tbsp…). Either way, I’m definitely pinning this recipe to my Pinterest and will make it again for my housemates as they were drooling over it when I was cooking it this first time! This will be our first Elf-fort in our joint project. Excited to try this. I love eggplant and I think Big Solid will be pleasantly surprised!! My local produce delivery brought Japanese eggplant this week and I’m dying to try them. Do you think they’d work in this recipe and, if so, would I cook the same? They’re smaller than a traditional eggplant. I think you can do it with Japanese eggplants. Just use several of them and start checking them after they’ve baked for 10 minutes–they’ll get done more quickly than a large eggplant. The one thing that worries me is that there is a higher skin to “flesh” ratio for small eggplants, so you may have to use quite a few and it won’t be as easy peeling them. Susan, those dishes are BEUTIFUL!!! This was fantastic!!! I will be making this again and again. Thank you for sharing. I can’t wait to try this tomorrow-sounds delish! We love cooking Indian food and this sounds perfect to go along with a few other dishes for dinner. Just a tip to avoid “gnarled” ginger in the bottom of the crisper drawer: put it, skin on, in a freezer bag in your freezer. Whenever you need fresh ginger, peel the skin off the portion you need with a vegetable peeler, and then grate the exposed portion, frozen, on a cheese or micro plane grater. Voila! You have fresh grated ginger perfect for measuring out or making into a paste. You can also slice or dice frozen ginger with a sharpe knife and use it the same way you would fresh. Happy cooking! Oops, just saw that someone else suggested the freezer ginger trick waaaay up in the comments. Please feel free to delete my previous message, but thanks for the great recipe. A good tip always bears repeating. Thanks for commenting! I recently made this and it was delicious. I served it over quinoa. The only thing I did differently was use an immersion blender on it before adding the cilantro, as that’s how we always ate it in our fav Indian restaurant. Great job Susan! I’m not sure how you got yours to look so lovely. 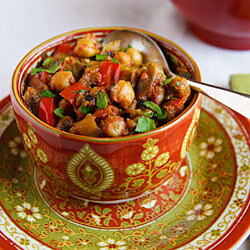 After adding the diced tomatoes mine looked more like sauce and less like piece of red pepper, chickpeas and eggplant. All mine were covered with the tomatoes and looked mushy even though they weren’t really. The flavor though was spectacular! We love Indian food….thank you so much. Thanks for Sharing this Amazing Recipe Susan! I am Indian and I know how delicious ‘Baigan Bharta’ be like. 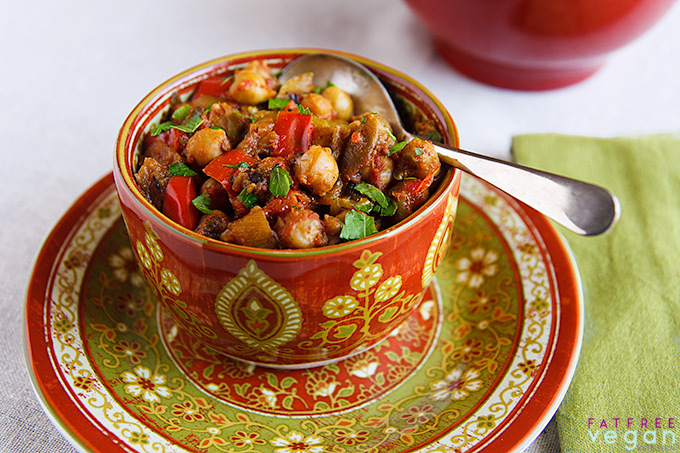 I will surely try Making Eggplant & Chickpea Curry This time. Seems Yum! Wow – just SO yummy!!!! As someone who is gently pulling herself from eating meat, I often find myself thinking”oh that’s yummy…just needs some chicken” as I try vegetarian/vegan recipes. NOT THE CASE for this DELICIOUS dish!!! The complexity of the spices and the wonderful textures are so satisfying! I’ll be making this again and again!!! Do you think this would be good served cold, at a pot luck, like a salad? I think it’d be fine but probably better room temperature rather than cold. Hi. This sounds perfect for my new year health kick, as a veggie/vegan that’s been over indulging !! Could I make this in a slow cooker if I toast the spices first to release the flavour a bit before adding to the Crockpot? I’m no expert on crockpot cooking, but it sounds like that might work. To be on the safe side, you might want to bake the eggplant first, as in step 1.